Here’s a scenario that may sound familiar: For one reason or another, you wind up on a certain brand’s website. Maybe you click around for a bit, curious about their offerings. Maybe you peruse their products or even add a few items to your cart. In the end, however, you click away from the website before making a purchase. But lo and behold, you soon begin to see banner ads or social media ads for the very products you’d just clicked through, and the brand stays near the front of your mind until you’re ready to buy. That’s called remarketing, and it’s an extremely effective way to market to potential customers who’ve already shown an interest in your product. If you feel intimidated about getting started with remarketing, you’re not alone — but don’t worry, it is simpler than you think to set up. In this article, we’ll discuss remarketing (also called retargeting) and why it’s a great way to increase your customer conversions. We’ll also explain three different types of remarketing campaigns and show you how to set them up. At its most basic, retargeting is an online advertising strategy in which ads are shown to customers who visited your website but left before purchasing anything. This can be done through display marketing (e.g. banner and sidebar ads), paid social advertising like Facebook or Instagram ads, and RLSA (remarketing list for search ads) campaigns. Pixel-based remarketing (more on this later) is the most commonly-used retargeting method, and the one we’re going to be focusing on today. Still, we’d be remiss if we didn’t mention list-based methods. With pixel remarketing, you use code to re-display material to site visitors. Thanks to the marvel that is modern technology, this process is highly-automated and timely, with visitors being immediately retargeted once they leave your site. Less common is list-based retargeting, which can help you convert website visitors who’ve already given you their contact information. It doesn’t have the real-time automation that pixel does, but you’re able to make much more specific ads because you have control over what contact information gets added to each list. Unlike pixel retargeting, you’re in charge of manually maintaining and uploading these lists. This method works well if you already have extensive lists of customers you’d like to target — which is why, if you don’t, pixel-based remarketing is a better place to start. How does pixel retargeting work? According to Search Engine Land, only about 2% of web traffic to the average site actually converts into sales. That means 98% of the people who looked at your stuff are still out there, in the world, waiting to be converted. Many of them were probably interested in your products but just not ready to buy at the time — so retargeting them with ads is a strategic way to optimize your conversions and boost your sales. Take Myfix Cycles, for instance. The Canadian bicycle retailer used strategic retargeting by leveraging a combination of Google Display ads and Facebook ads. 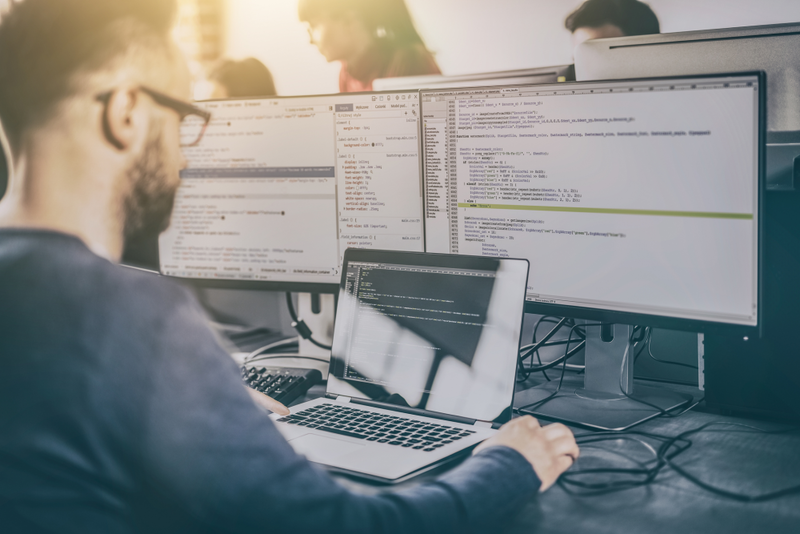 The display ads brought in a decent amount of new website traffic, but very few new site visitors actually purchased anything. 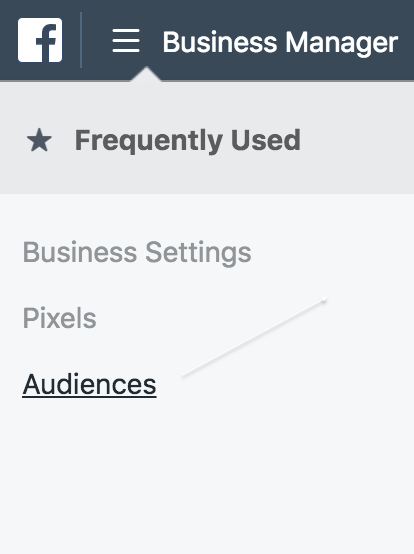 Thanks to a pixel installed on their site, they were able to create a second (and third, and fourth, and so on) touchpoint with those visitors, retargeting Facebook users who visited their site within the last two weeks. It worked: The retargeting campaign earned $15 for every $1 spent. We suggest you start with a small retargeting campaign to get your feet wet and see what works without blowing a huge budget. As we saw with Myfix Cycles, we know that — generally speaking — display ads are a decent way to generate website traffic, but Facebook ads typically perform better at converting customers. 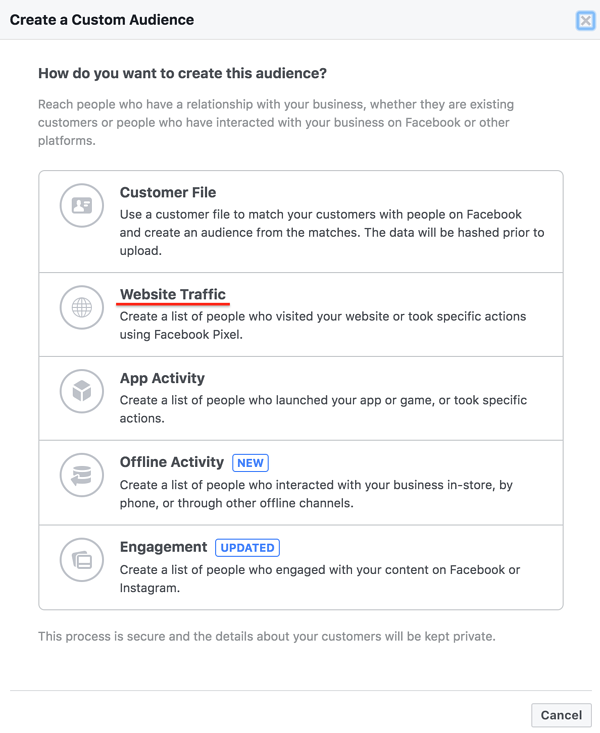 So with that being said, we recommend you start with a small Facebook ad campaign to start, then expand to include other methods of remarketing. As you start to see profits on your ads, you can increase your daily ad spend. You can create a list of customers who’ve visited your site. Once you click this, you’ll be taken to a page where you can decide who to target. Here you can input specific URLs, set the amount of time you’d like to target for (for instance, the last 14 days), and give your audience a name. Facebook will then populate the code for your pixel. You can put this on your site now, or give to a developer to do it for you. Ta da! You’re ready to start retargeting site visitors and converting customers. You may also be interested in setting up a display remarketing campaign — AKA banner and sidebar ads — to retarget visitors who clicked away from your site. This can be effective for brand awareness, as it keeps your brand at the front of your potential customer’s mind. Here’s how you can get started. 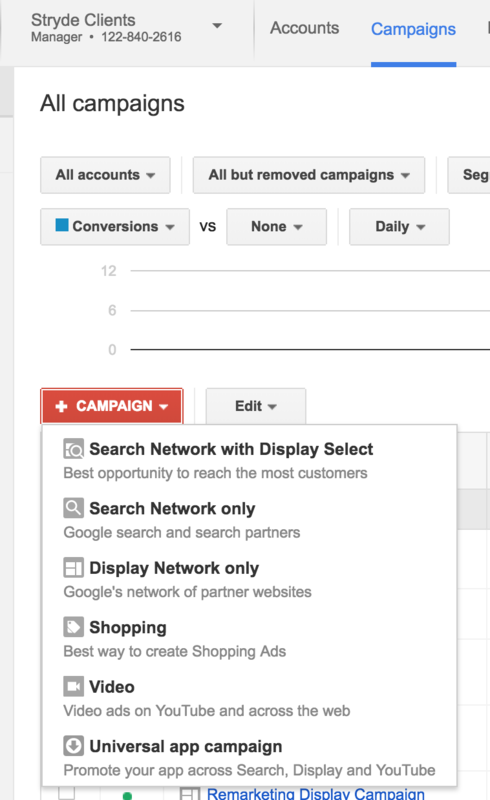 Once you log in to your AdWords account, click “Campaigns” and then “Display Network only.” Make sure the “Marketing objectives” and “Buy on your website” options are both ticked. You can then choose your campaign name and bid strategy. Choose how much you want to spend on your ads. We recommend starting small between $500 - $1,000 a month to collect data to determine how things are performing. Once you have maximized your budget then you can start to incrementally add more budget each month. 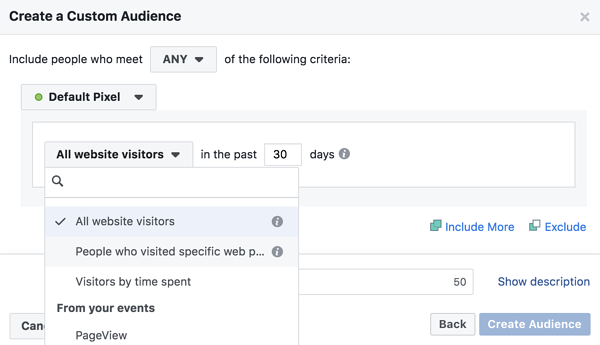 Select “Choose how to target your ads,” then “Interests and remarketing.” You’ll see a drop-down menu to select a category: choose Remarketing lists. AdWords will create an “All visitors” list for you, which is a great and easy place to start. You’ll begin remarketing to all non-converted visitors on your site. You can check out Google’s step-by-step instructions to set up a display marketing campaign if you need more guidance. Another unique way to remarket to interested customers is to set up an RLSA (remarketing lists for search ads) campaign. In other words, you can customize your search ads campaign for customers who have already visited your site to tailor your ads specifically to them. It works like this: When someone leaves your site without converting, they are likely to continue searching for what they need with Google. By placing a remarketing tag (similar in principle to a pixel) on your site, you can immediately begin building a remarketing list of site visitors. Then, you can customize your search ads specifically for them — for example, you can show different ads to customers who have visited certain pages on your site, or increase your bid specifically for people who have visited your site within a certain amount of time. Tag your site for remarketing. Google has instructions on how to add a remarketing global site tag here. The code tells AdWords to add every site visitor to your list. Add the remarketing list to the ad groups and campaigns you already have going. You can then customize, raise and lower your bids based on your remarketing list. Here is how to create a custom combination list to choose specific audiences for remarketing. Because you’re strategically targeting people who’ve already demonstrated some level of interest in your site by clicking through from an ad or search result to your page, remarketing is a powerful way to increase your conversions and — when done right — show you a solid return on investment. TJ has been doing digital marketing for over 10 years. He currently is the VP of Marketing at Stryde, which is an ecommerce digital marketing agency that helps businesses grow using SEO, content marketing, influencer marketing and other social media marketing tactics.